Did you know that July is national blueberry month? I wasn’t aware of this until recently, but I’ll happily celebrate an excuse to consume more blueberries. Blueberries are high in fiber and vitamin C, as well as contain phytonutrients that are touted for their antioxidant and anti-inflammatory properties. Combined with the perfectly sweet taste, it isn’t surprising to hear that North American consumption has nearly tripled in the last 15 years. I’m always trying new ways to eat blueberries, both savory and sweet. 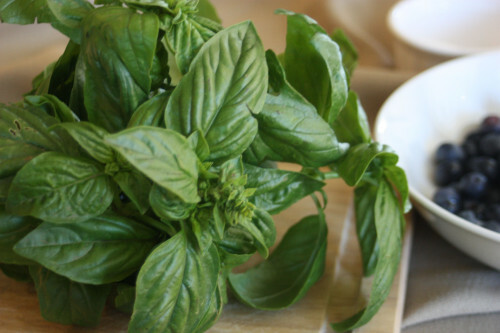 Last year I sampled a blueberry jam that had basil in it, and I thought it was a great combination that would taste even better with fresh ingredients. The result was this tasty compote, that becomes the star on waffles. 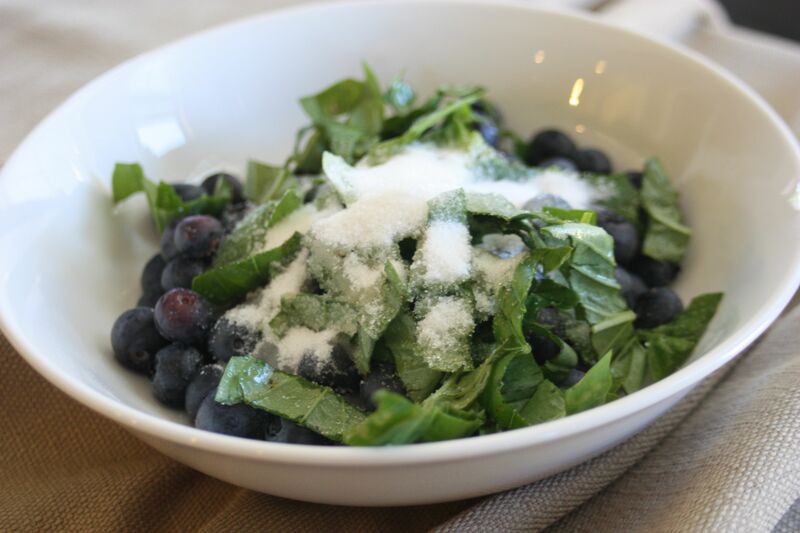 Making the blueberry-basil compote is simple – just mash together fresh blueberries, fresh basil and sugar until a syrupy sauce is formed. After making some gluten-free waffles and cheesecake drizzle ( cream cheese, sugar, and orange juice mixed together), I paired them all together for a special weekend morning breakfast. Another interesting fact about blueberries is that the United States is the world’s largest producer of the blueberry. The sweet treat, is grown in quite a few states throughout the United States, from Washington and Oregon, to Michigan, New Jersey, and on down to Georgia and North Carolina. North Carolina is one of the main producers and they proudly promote their produce. In fact, they publish a yearly blueberry recipe collection as a special edition to the Our State magazine. 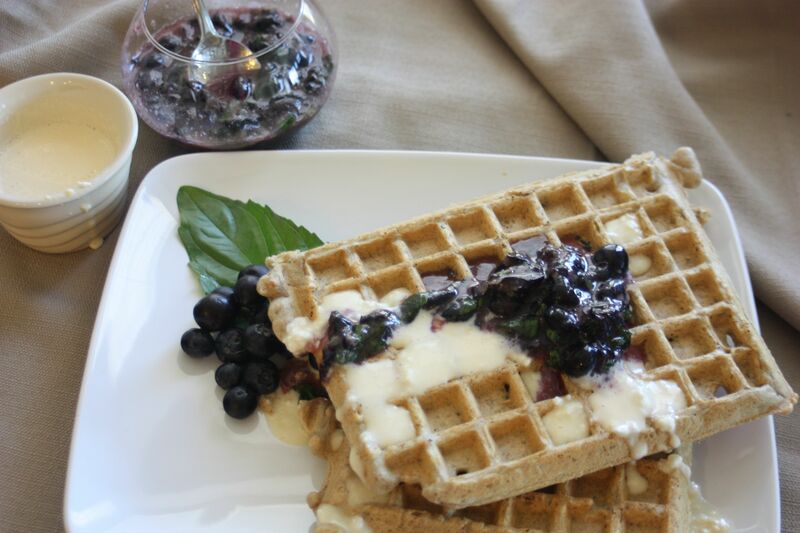 You can find my Blueberry Basil Compote with Orange Cheesecake Drizzle over Blueberry Waffles in this year’s edition, along with a variety of other blueberry recipes that I can’t wait to try. 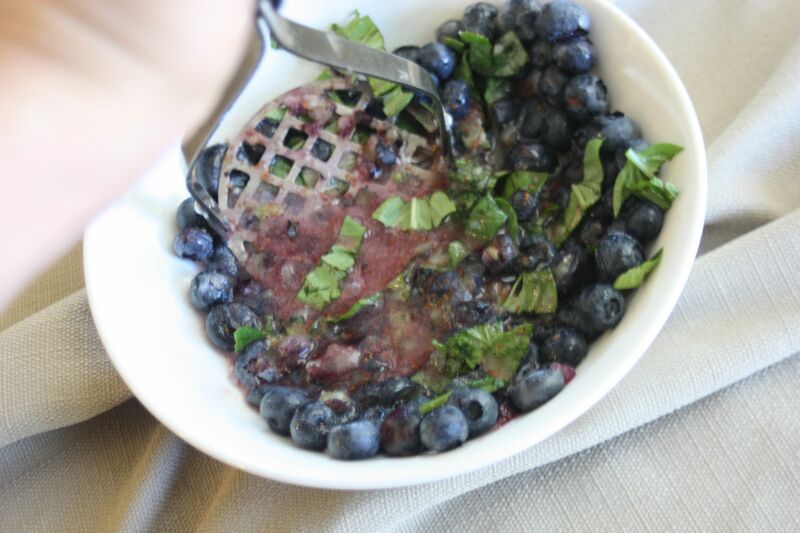 To make the compote, place the blueberries, basil, and ¼ cup white sugar in a large bowl and macerate with a potato masher. Place in refrigerator until ready to use. To make the cheesecake drizzle, place the cream cheese, orange juice and ¼ cup of sugar in a medium size bowl and mix together with a whisk or electric mixer until no clumps remain; set aside. Preheat a waffle iron. Mix together the flour, remaining sugar, baking powder, baking soda, salt, cinnamon, and orange peel in a large bowl. In another small bowl, mix together the egg, melted butter, and water. Stir the liquid ingredients into the dry ingredients until just combined, then stir in the dried blueberries. Pour mix into a waffle iron in batches (batter will make 4 waffles), cooking until golden brown according to the waffle iron instructions. Once cooked, plate the waffles, topping with 1/4th of the orange cheesecake drizzle and then 1/4th of the blueberry-basil compote. Serve immediately.